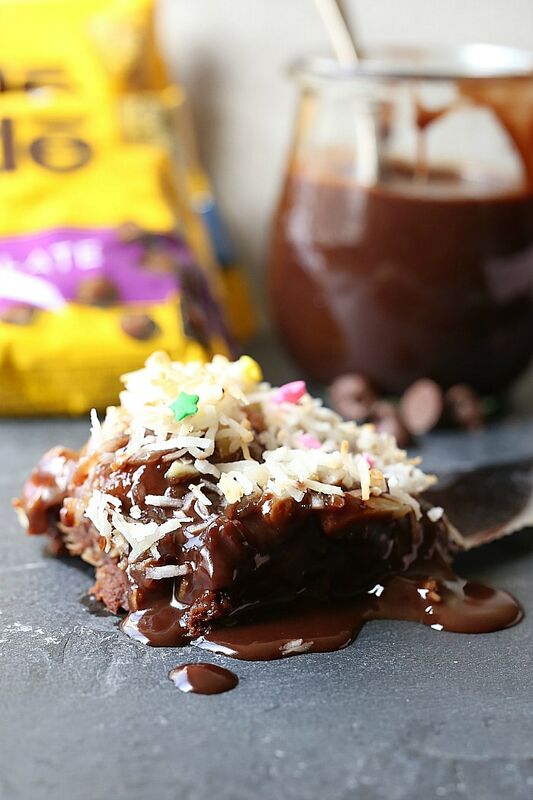 Spring just got sweeter with these easy Magic Layer Brownie Bars made with 3-ingredient Paleo brownies, coconut milk chocolate ganache, date caramel, almond slivers, white chocolate chips and toasted coconut! 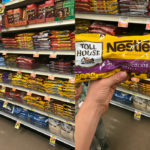 This post is sponsored by my friends at Nestlé® Toll House® and all opinions and words are expressed and written by me. Brownies, chocolate ganache and more chocolate oozing out of every bite! 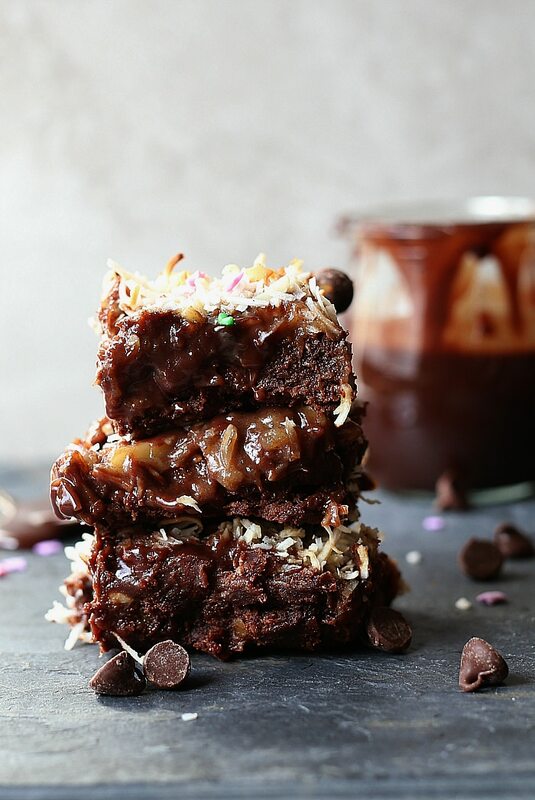 Dessert doesn’t get much better than these magic layer brownie bars! With every bite you are gonna get rich chocolate flavor like lava melting into every taste bud! Traditionally magic layer bars use a graham cracker base and are topped with sweetened condensed milk. 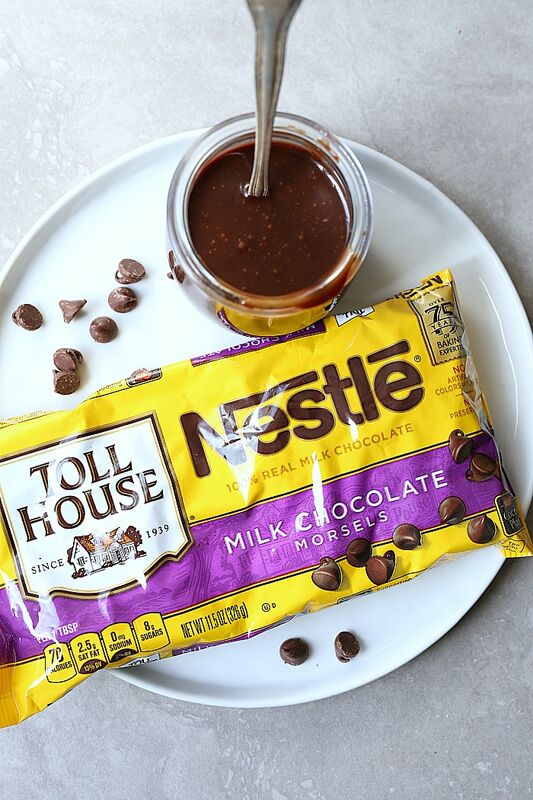 Instead, these bars have an easy brownie base and are topped with 2-ingredient chocolate ganache made with coconut milk and Nestlé® Toll House® milk chocolate chips (you can get them at your local Walmart!). Then it is topped with homemade (and refined sugar-free) date caramel! It gets better… can you handle it or is your mouth just drooling yet?!? Then add white chocolate chips, almond slivers or walnuts and shredded coconut! Bake it to mix and “set” the flavors together and the result is the most DELICIOUS and grain-free magic layer brownie bars! 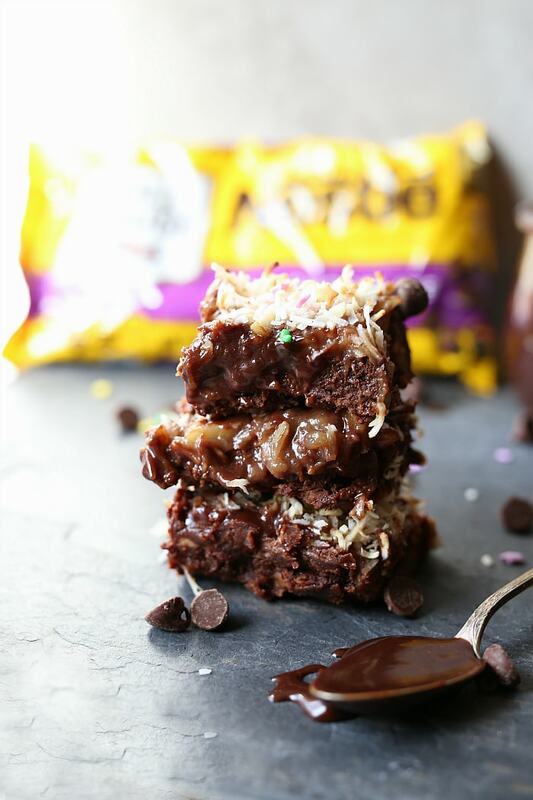 These bars are top notch, right up there with my caramel chocolate oat squares, paleo brownies and vegan bean brownies! So top notch that you might just want to eat the entire pan! 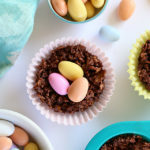 Please just save yourself from eating the ENTIRE PAN and bring a batch to your next party gathering – perfect for a Spring and Easter dessert! 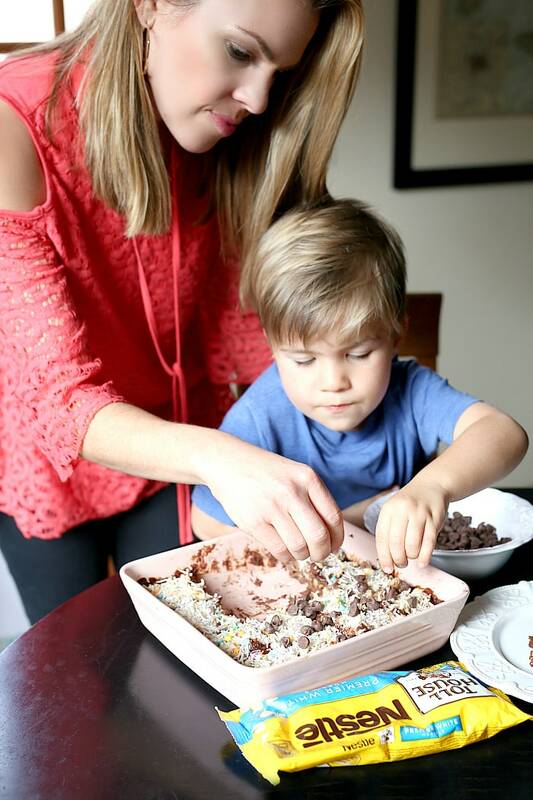 One of my favorite Easter traditions is to make desserts with my boys to enjoy after Easter brunch. And every year (when they are sleeping or not around;-)!) I make these coconut candy balls (a recipe passed down by my momma) to put in the boys Easter baskets. My mom made them for me and now I make them for my family. I relish in these times my children are young and we can enjoy our time baking together in the kitchen. Not to mention we all love to eat any chocolate morsels floating around! To make the brownies, use crunchy almond butter, three bananas and cocoa powder. Then mix those three simple ingredients together and bake it for 20 minutes. 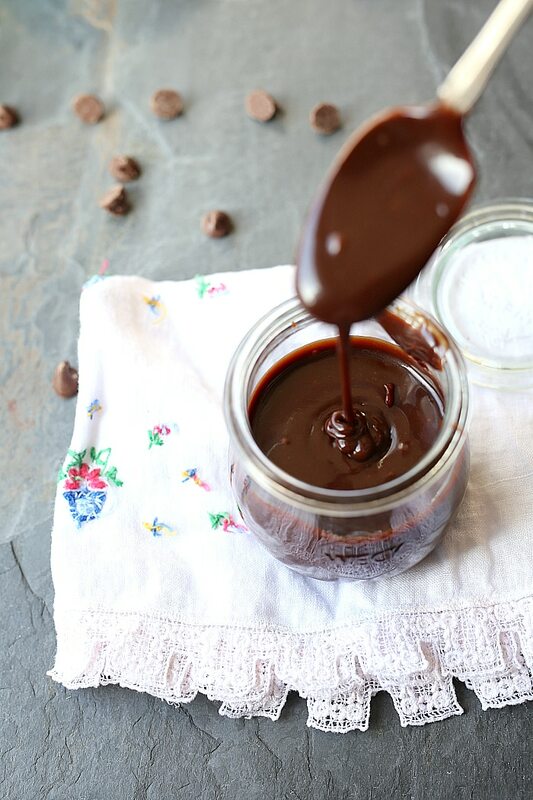 Chocolate ganache is chocolate mixed with hot cream until it becomes a smooth mixture. I like to use full-fat canned coconut milk, heat it to almost a boil and then whisk it together with chocolate morsels. It makes the most fabulous ganache with healthy saturated fats from coconut milk instead of unhealthy saturated fats from cream. Pour the chocolate ganache over the brownies. Most 7 layer bars or magic bars call for condensed evaporated milk on top of a graham cracker crust. I like to supplement the sweetened condensed milk with a homemade caramel made from dates and canned coconut milk! The dates sweetened the coconut milk naturally instead of with extra white or cane sugar!!! Soak 12 dates in water for about 1 hour to soften them. Remove the pits and then add them to a blender with canned full-fat coconut milk. Let it blend on high for about 1 minute or until it smooth. Pour the date caramel over the chocolate ganache that covers brownies. Sprinkle on top of the caramel layer: shredded unsweetened coconut, Nestlé® Toll House® white chocolate chips and almond slivers or walnuts! Then bake your magic layer brownie bars for 20 minutes to set everything. The chocolate will be melted so let the brownies cool completely before serving or serve on top of vanilla ice cream while it is still warm! It is so delicious it will literally just melt in your mouth! These magic layer chocolate ganache brownie bars are oozing with rich melted chocolate morsels and natural caramel. You can also change the base and use cookie dough instead of brownies. I promise you will love this recipe! So moist and soft with creamy chocolate flavors that melt in your mouth- and YES your hands too! Spring sure did just get sweeter! 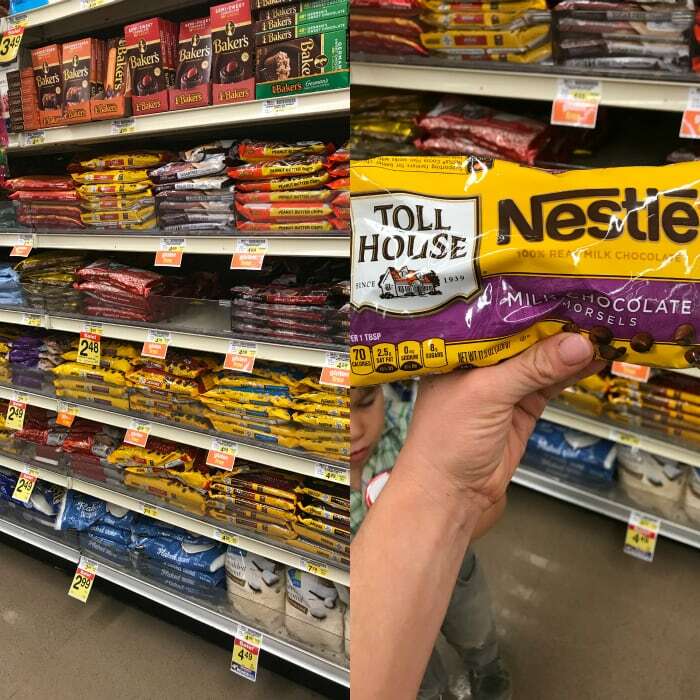 Thank you again to my friends at Nestlé® Toll House® for sponsoring this post. And don’t forget to go grab a bag of your favorite white chocolate chips, semi-sweet chocolate chips or milk chocolate chips which can be found here! Preheat the oven to 350 degrees F. Prepare a 9-in. x 9-in. 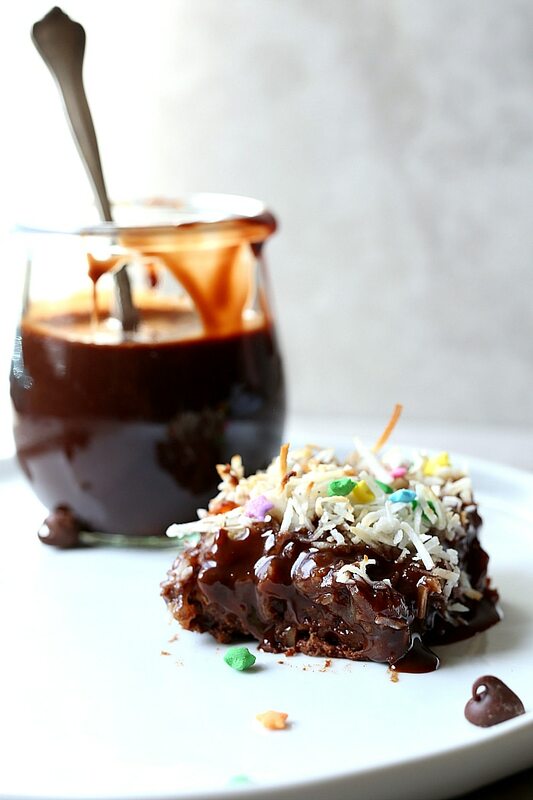 square baking dish by spraying it with cooking spray or rubbing coconut oil around the sides and bottom so the brownies do not stick. In a large bowl mash the bananas with a fork until smooth. Add the almond butter and mix until smooth. Add the cocoa powder and optional cinnamon and blend until no visible cocoa powder is seen. Pour the batter into the prepared baking pan and bake for 20 minutes. Remove from the oven and let cool slightly (or make ahead of time then add layers when ready to use). For the chocolate ganache: Heat the coconut oil on the stove until is just about to boil. In a large enough bowl, add the chocolate morsels and hot coconut milk. Whisk together until melted then add the vanilla and salt. Whisk some more to combine. For the caramel: make sure to pre-soak the dates for about 1 hour. In a blender add the dates, salt, vanilla and coconut milk. Blend for about 1 minute or until smooth. Add the layers: Top the brownies with chocolate ganache and smooth with a spatula evenly to cover. Add the caramel and also smooth over with a spatula to cover. 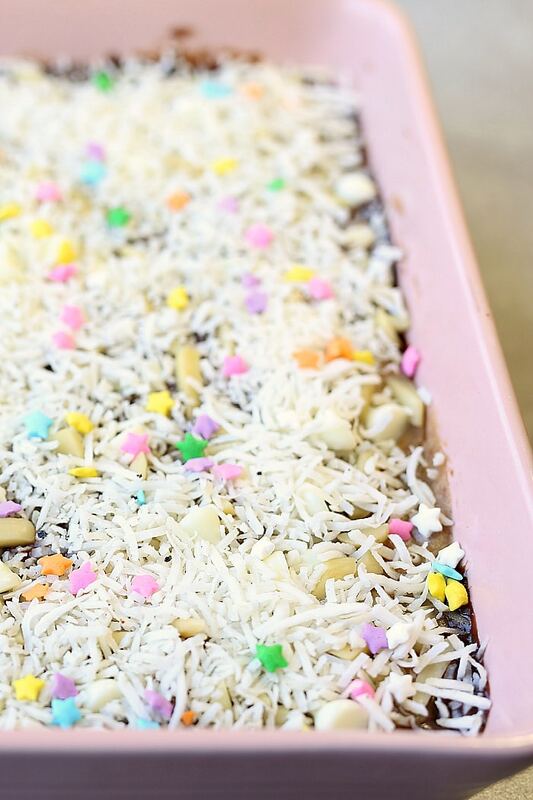 Sprinkle the shredded coconut, nuts, and white chocolate chips evenly on top. Bake 20 minutes more (with all the layers added). Remove from the oven and let it cool completely before serving or serve chilled. Top with colorful sprinkles right before serving! If the almond butter is hard, heat it in the microwave for about 20-30 seconds or until it is softened before mixing with the banana. *Make sure to do the layers the day of eating, otherwise it may get a bit mushy. To save time you can make the brownie ahead of time. 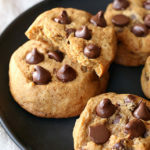 Oh and a reminder to add this recipe to your “Must Make Spring Desserts list”:-) You might just regret it if you don’t! Do you have one of those lists? I have lists for everything – it’s the only way I can function efficiently. Or you can PIN IT! I hope you try this! It’s become a new family favorite sweet treat! What’s your favorite chocolate treat? Brownies, chocolate chips, chocolate bars, chocolate ganache or all four?! Oh wow, these look divine! This recipe would be yummy to try. They are delicious and rich! Enjoy!